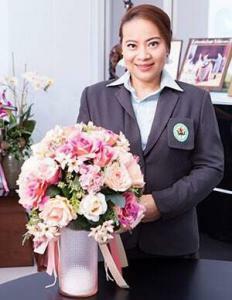 Mrs. Sasima Arjsongkram or Mrs. Dao, Thai pharmacist , Communication and PR Director of The Pharmaceutical Association of Thailand under Royal Patronage and Editor of “Ya-Na-Roo”, Journal for Thai Pharmacist Profession ,a former DJ of Traffic and News Radio, has developed “Prikka Spicy Coffee” as the World’s First Spicy Coffee . 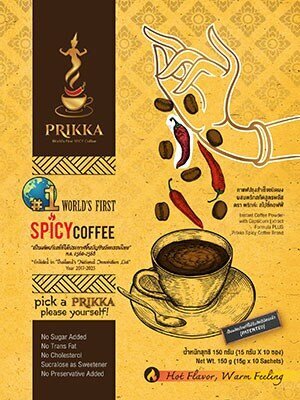 Her new product, Prikka Spicy Coffee, has been formally announced as Innovation, patented and enlisted in Thailand’s National Innovation List for 8 years (Year 2017-2025). Currently, Prikka Spicy Coffee is preparing to be an international product creating new experience for coffee drinkers around the world with Hot Flavor, Warm Feeling as the Slogan “Pick a Prikka, Please Yourself”. Spicy Taste comes from Thai Bird Chilies Extract which represents Thai Cuisine Identity.This is the very first time for commercial 3 in 1 coffee to have Prik-Khee-Nuu or Thai Bird Chilies as an ingredient. The new taste of coffee is spiciness from Thai Bird Chilies Extract which is Thai Cuisine Identity while its benefit is to stimulate energy burning, and the stored fats. The weight loss potential of capsaicin has been widely studied, and it is known that capsaicin helps in reducing body weight. Moreover, Capsaicin has thermogenic effect properties which mean that it helps in heat production in the body. Consumer can feel of this burning effect like burning calories in the body to produce heat so that they will feel warm after drink. Therefore, we can feel warming effect that can be beneficial to people who need to be warm. The formula shall be a good choice of functional coffee 3 in 1 for everyone around the world with the new taste that comes with benefits. Other ingredients in this formula are integrated together for health benefit of functional coffee such as capsicum extract, garcinia extract, white kidney bean extract , cactus extract , L-Carnitine-L-Tartrate, Chromium Picolinate, L-Valine, L-Arginine and Fructoligosaccharide with the properties of no sugar added , no trans fat , no cholesterol , no preservative added , low energy , sucralose as sweetener. Mrs. Sasima has 3 girls, 2 of them are identical twin. She believes every mom can be an inventor “To the world You are a mother but to your children You are the world”.